Happy Belated Turkey Day to all my family, friends, and knitters out there. I enjoyed some delicious eats with That Guy and a whack of "homeless' grad students. The Adamas shawl for my big sis is blocking. I started another hat. For whom? No idea, just seemed to be the right project for this tweedy yarn Astrid brought me from Germany. As far as I know, I'm not doing any other Christmas knitting now that the shawl is finished. The exception will be for Secret Santa at school. I am contemplating this Handmaiden Sea Silk. I think it will be a stole of some sort. Hmmmm. Any suggestions? I'm headed over to Ravelry to troll for the perfect pattern. Technical theatre rehearsals provide the perfect opportunity for the type of knitting that does not, for the most part, require counting. Or, for that matter, the ability to SEE what you are knitting. 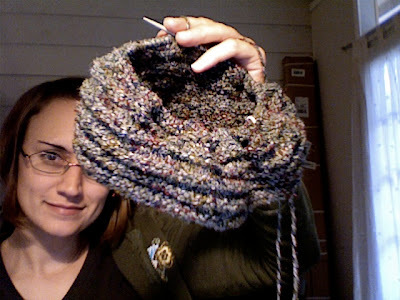 If it is all knit stitch, in the round, or all garter stitch, I can do it without looking. Enter this hat that I knat (I'm wearing a T-shirt with Dr. Suess characters on it today) mostly in the darkness of tech rehearsal for Ashes, Ashes. Yes, I felted it. It was rather laughable prior to that felting since I made it HUGE to begin with - on purpose! The fiber started out as a Lorna's Laces roving in the Camoflage colorway. It was a Secret Santa gift from last year. I used half of the roving, about 5 oz., to spin a thick/thin 2-ply yarn on my sister's wheel back when I visited her in August. I probably used about 4.5 oz to knit the unfelted hat on US 9 needles. 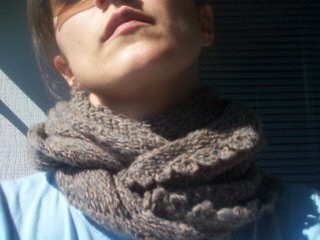 I felted it in a lingerie bag with one large towel in the washer on a hot/cold cycle. It took two cycles to get the density that I wanted. Then, since I practically live in the costume shop at school, I had access to a hat block which I blocked the hat with this short rolled brim on the sides and back. To finish it I will sew a hat band on the inside using some millinery grosgrain. What separates millinery grosgrain from regular grosgrain ribbon that you can purchase at JoAnn's is that regular grosgrain is usually polyester or some other synthetic fiber. Millinery grosgrain is 100% rayon. You can shape it into lovely curves with the iron. I will take some pictures when I put the band in. I may also order some flexible millinery wire for the edge of the brim. Both the hatband and wire will help the hat keep it's shape while remaining flexible. I want to be able to put it in my bag when I'm not wearing it. This will be my cold weather cap that I can wear with my scooter helmet. It can be pretty cold at 20 miles an hour late at night in January!